The KevinfromCanada blog was delighted to sponsor the Read, Write, Review! program at Calgary’s Lord Beaverbrook High School as part of this year’s WordFest program. Five authors were involved in presentations to students there — as part of KfC’s involvement, I asked students to conduct an interview with each author for posting here. This is the third, conducted and written by Rebekah Twaddle. Thank you, Rebekah! Tanya Davis, author of the poetry book At First, Lonely did Lord Beaverbrook High school the great pleasure of presenting for two hundred students on October 7th, 2011. 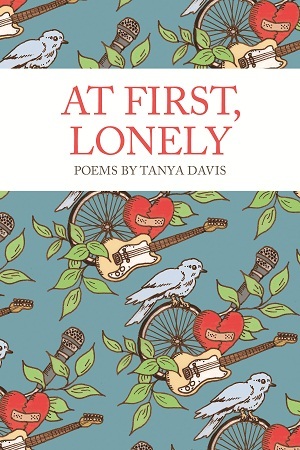 At First, Lonely is Tanya’s first book to be published and came out just this past year. Plus, her artistic work has been frequently uploaded and viewed on web sites, including YouTube. Tanya is a cheerful woman of thirty-two years and actually aspires to one day accomplish a novel. After an entertaining presentation, which included vocal and musical performances of her work, I had the opportunity to interview Tanya. Rebekah: What inspired you to start writing? Tanya: I’d say pretty much just everyday life, connections, relations, love; philosophical questions. Rebekah: When did this passion begin? Tanya: Probably when I was really little — before school. Rebekah: What’s the most difficult aspect of writing a poem? Tanya: Definitely finding the words. Finding ways to say things and make them sound good at the same time. Rebekah: What’s most rewarding part of writing? Tanya: The solitude. It gives you the perfect excuse to observe and think. Rebekah: What’s your advice to young writers? Tanya: Be patient. Make it about writing rather than achieving a goal of — say — getting a book published before you’re twenty. Rebekah: Can you make a living off of writing? Tanya: You can make a good living. The pay isn’t all that high, but life becomes fulfilling when you’re following your dreams. Rebekah: Are their certain pieces of writing that have inspired you? Tanya: Shane Koyczan and Kinnie Starr, Margret Atwood. Classical Canadian authors. Rebekah: I noticed you used music in your presentation, what does it mean to you? Did you write it all? Tanya: It was all my own, and I see it as another way to communicate. Rebekah: How were your high school years? Tanya: Pretty good. I was really busy, tried parts of everything. Rebekah: Are there certain messages you’d like your work to convey? Tanya: Acceptance, tolerance, connection, love, honesty, vulnerability. Rebekah: Can you describe your writing process? Tanya: It could be described as slower, but I write every day. I found Tanya Davis to be quite a unique and intriguing “character.” She was enjoyable to speak with and was rather outgoing and friendly making this interview a great deal of fun. During the course of her presentation she had every audience member captivated with her words and her willingness to speak openly. Students were initially shocked that any adult would be so free with their words but soon they soaked them up eagerly. As for At First, Lonely I feel that it is a wonderful read. Tanya’s poems are deep and insightful, giving the reader a whole new perspective on various aspects of life.